Like many working mothers, Maribeth Klein is juggling her career and four year old twins and trying to keep sane. When she starts to feel unwell one day she attributes it to indigestion but luckily an already planned visit to her gynecologist soon has her on her way to the ER to get check out. As she’s getting tests and seeing specialists she is still trying to coordinate schedules and is even trying to downplay the seriousness of what is happening to her but she is in the middle of a medical crisis and requires a bypass. Finally after some scary moments and several days in the hospital, Maribeth is fine and returns home. She is scared after what she’s been through but once she’s home the demands of family life kick back in and Maribeth decides that the only way to survive is to run away. She leaves a note for her husband and takes a train to Pittsburgh to get away from everything. In her new apartment, away from phones, deadlines and to-do lists, she starts to relax and to take care of herself. She finds a network of support in her young neighbors, a cardiologist that actually listens to her, and she even decides to look for her birth mother. Being away from her life means she can finally see what went wrong in her marriage and how she can get back to a healthier lifestyle. What captured my attention first about this book is the idea of running away. Who hasn’t thought about that at one time or another when life is stressful or you are dealing with a major situation at home? I was quickly reading through the pages to find out what Maribeth would do and there were a few surprises along the way. I really must read this at some point. 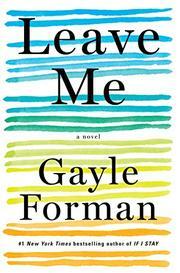 I have read and enjoyed Gayle Forman in the past. Oh yes, running away has its appeal at times, doesn’t it? Sounds like a good book. I remember Ann Tyler’s Ladder of Years about a runaway wife and wondering what it would be like! This one does sound good. I think many people fantasize about running away at one point!